Given the order to mobilize in September of 1939, the Edmonton Regiment was ready to go in three months and left Edmonton in December of that year. They then spent three years training in England before finally seeing action with the invasion of Sicily in July of 1943. What followed was a difficult struggle up the Italian boot including the battle for Ortona, a house to house battle unlike anything that had happened to the allies so far in the war, which some described as Little Stalingrad. With the Germans finally defeated in Italy, the regiment moved to North-Western Europe and ended the war in Holland. 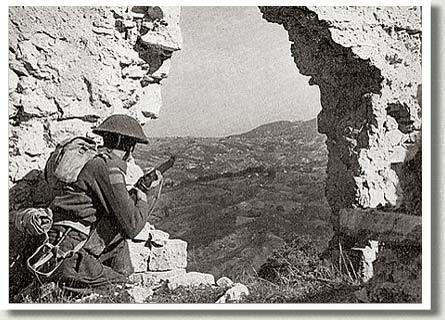 Edmonton Regiment Soldier, Colle d'Anchise, Italy, October, 1943. 1939 - Once again, the regiment mobilizes for war and leaves for Britain. January to September 1940 - The regiment almost makes it to France, twice. 1941 - 1942 - Highlights include years of training and waiting in Britain and the presentation of colours to the regiment by King George VI. January to July 1943 - The regiment is part of the invasion of Sicily. July to October 1943 - Done with Sicily, the regiment (now The Loyal Edmonton Regiment) crosses to Italy and begins the move up "the boot" from Reggio di Calabria to Colle d'Anchise. November to December 1943 - Highlights include fighting at the Moro River, The Gully, and especially Ortona. January 1944 to August 1944 - Highlights include fighting at the Arielli River, Liri Valley and the Hitler Line, and the Gothic Line. September 1944 to October 1945- Highlights include fighting from the Rimini to the Senio River, the move to North-Western Europe, the end of fighting in the Netherlands, and the return home.